Museum of "Geology and Mineralogy"
The museum of "Geology and Mineralogy" actually dates back to the foundation year of the Agrochemistry and Soil Science Department (1946). Then the director of Kharkiv Agricultural Institute named after V. V. Dokuchayev Academician O. N. Sokolovskyi invited the famous geologist, candidate of geological-mineralogical sciences, docent O. O. Kireyev to give a course of “Geology with Introduction to the Mineralogy” for students of the Agrochemistry and Soil Science Department. At the Chair of Soil Science which was a part of the Department and was located in Kharkiv, str. 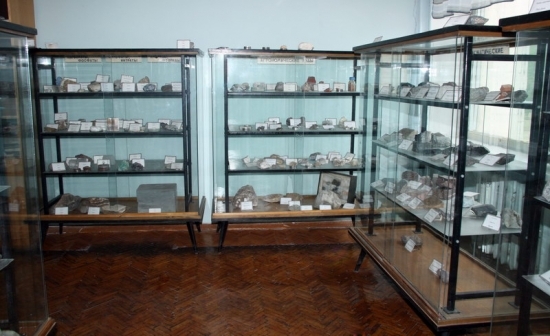 Dzerzhynskyi (now Mironosyts’ka), 92, the cabinet of mineralogy and petrology began its formation. Students and teachers gathered samples of rocks and minerals in various places of Kharkiv and surrounding areas during the educational practical trainings on Geology and Soil Science. A rich collection of minerals and rocks was in the cemetery in Artema Street (now there is a youth park there). 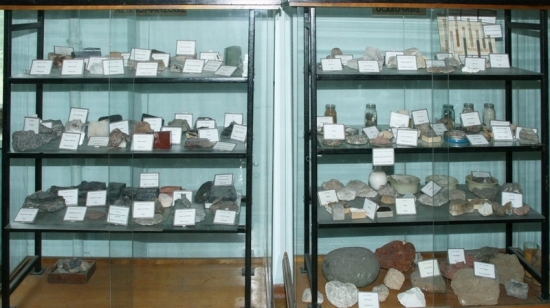 In 1977 at the initiative of the head of the Soil Science Chair O. M. Grinchenko the collection of rocks and minerals was purchased in Sverdlovsk (now Yekaterinburg – the Urals) where training collections were produced in the trust “Russkiye samotsvety”, its central board was located in Leningrad (now St. Petersburg). 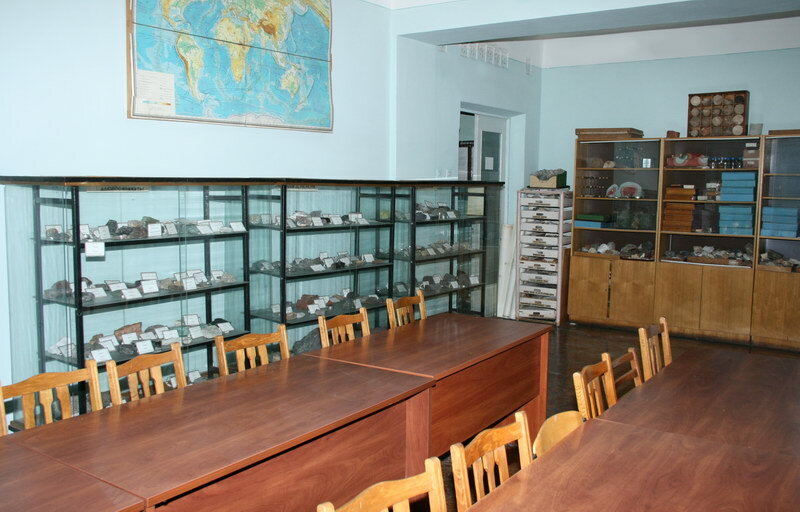 The training collection was selected and prepared for the display at the Chair by docent Kireyev O. O. and assistant (now professor) Tykhonenko D. G.
The collection of rocks and minerals was placed on the first floor of the building in the Dzerzhynskyi Street, 92 because it was the area of the Soil Science Chair. In 1977 the Soil Science Chair with Agricultural University moved from Kharkiv to the lands of the educational farm "Dokuchayevske" (then "Communist") in the new fourth building where the Department of Agrochemistry and Soil Science was located. Docent Chesnyak O. A. controlled the relocation of the museum who at that time was giving a course of “Geology with Introduction to the Mineralogy”. The museum of “Geology and Mineralogy” is located in the room 4-117 on the ground floor of the Soil Science Chair territory. 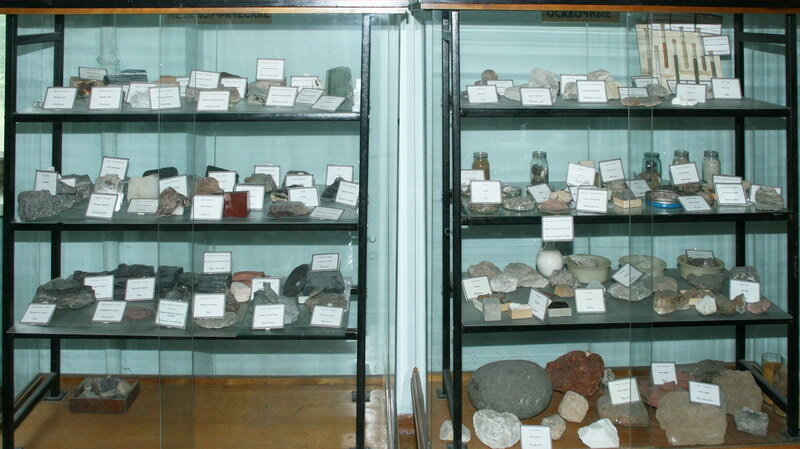 Quite a diverse collection of minerals and rocks of the museum conditionally divided into five parts: 1) collection of typical forms; 2) collection of minerals; 3) collection of rocks; 4) collection of agronomic ores; 5) collection of samples of minerals and rocks that were presented to the museum. Collection of typical forms is presented with exhibits that illustrate typical forms of the minerals in nature. There are 67 individual samples in the museum. The greatest ornament of this part of the collection are druses of pyrite, calcite, pseudomorphism on wood, bones; quartz crystals. Collection of minerals counts 340 pieces that are placed in cabinets according to their chemical classification. Silicates and aluminosilicates which have different colour, external forms etc. are widely presented. Collection of rocks comprises 210 pieces of igneous, metamorphic and sedimentary rocks. Collection of agronomic ores includes samples of minerals and rocks that are directly or indirectly used in agriculture. For example, phosphates, apatite, nitrate, gypsum, marl, limestone. 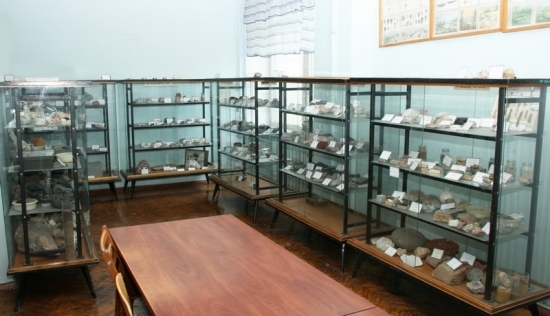 Collection of samples of minerals and rocks that were presented to the museum has separately gathered exhibits that the students of our University selected in field conditions during expeditionary practices on Soil Science, Geology etc. 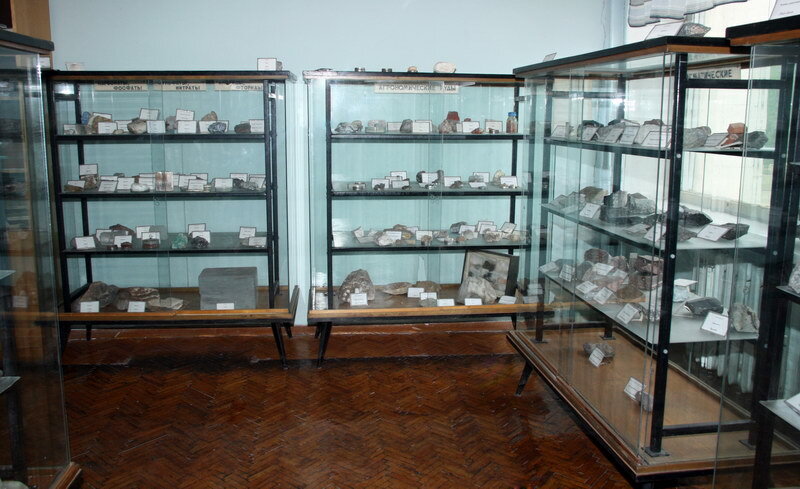 The museum has individually selected collection of rocks and minerals for students self-study in overtime.